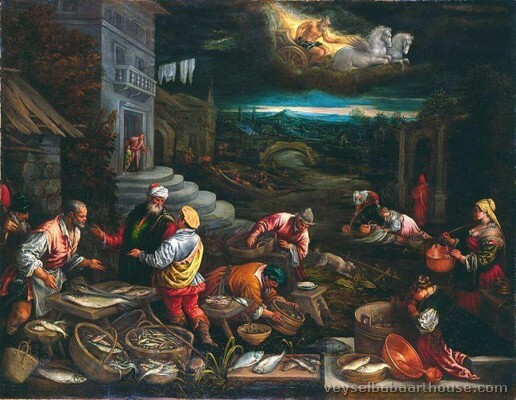 Jacopo Bassano (1510 – 14 February 1592), known also as Jacopo dal Ponte, was an Italian painter who was born and died in Bassano del Grappa near Venice, from which he adopted the name. 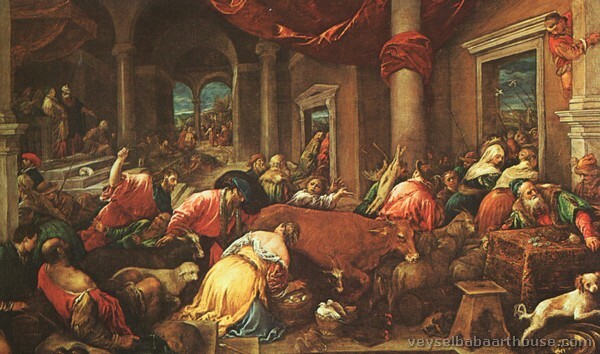 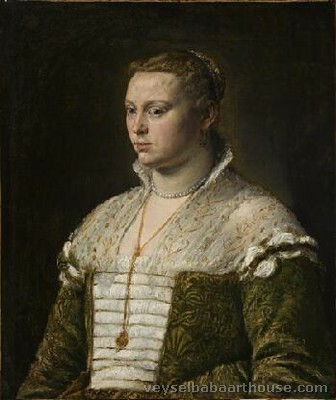 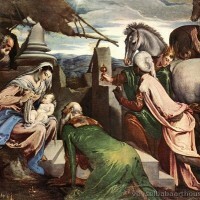 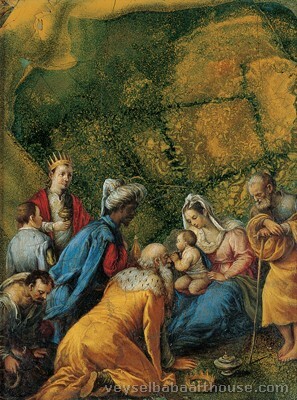 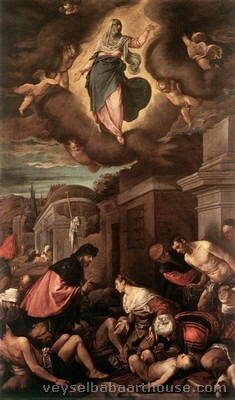 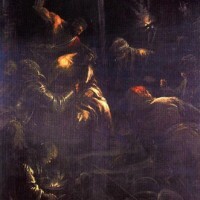 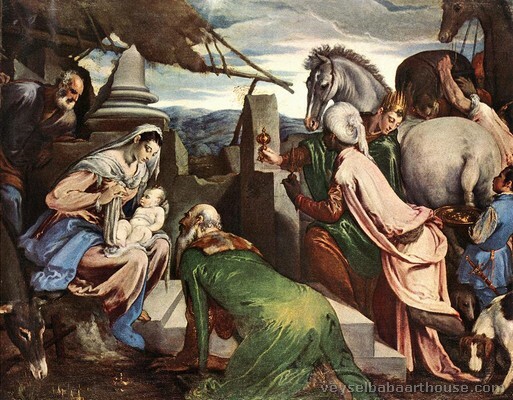 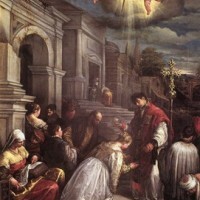 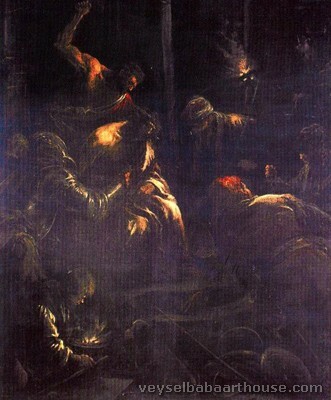 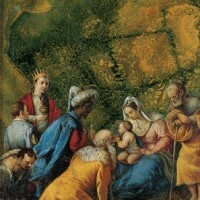 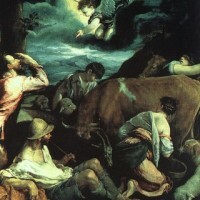 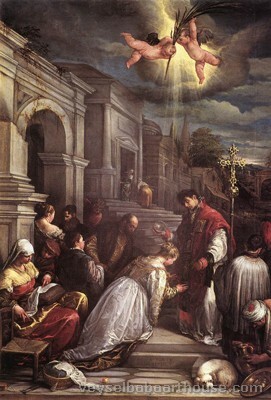 A pupil of Bonifazio Veronese's, he painted mostly landscapes and genre scenes. 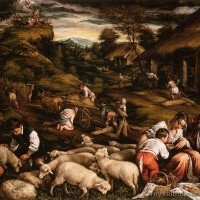 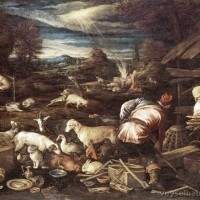 Bassano's pictures, and those of his two sons, Leandro Bassano and Francesco Bassano the Younger, who followed him closely, were very popular in Venice because of their depiction of simple country life. 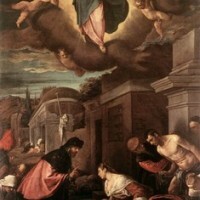 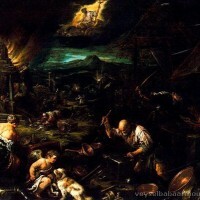 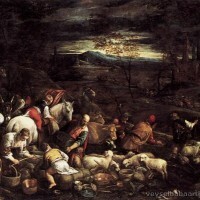 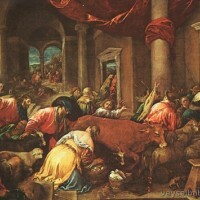 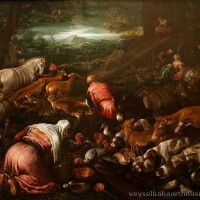 Bassano is considered to be the first modern landscape painter. 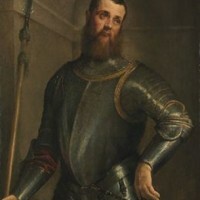 He was born around 1510 in the town of Bassano del Grappa, located about 65 km from the city of Venice. 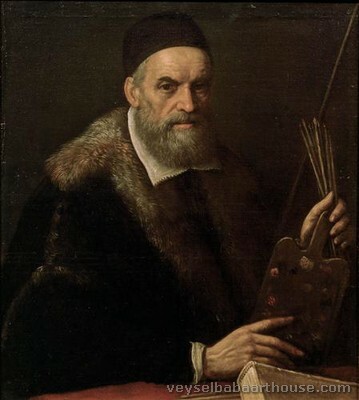 His father, Francesco il Vecchio, was a locally successful painter who had established a family workshop which primarily produced religious works in the local style. 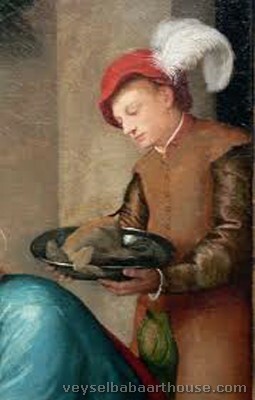 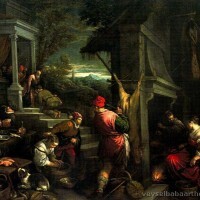 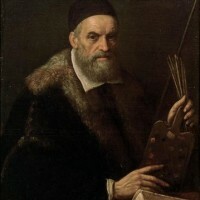 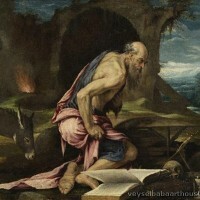 During his early youth Bassano was an apprentice in his father's workshop. 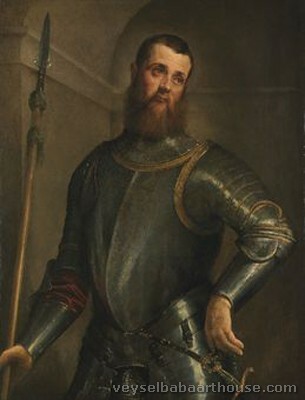 He eventually made his way to Venice in the 1530s, during which he studied under Bonifazio de Pitati (also known as Bonifazio Veronese) and was exposed to such famous artists as Titian and il Pordenone. 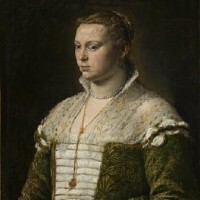 After his father's death in 1539 he returned to Bassano del Grappa and permanently set up residence there, even taking a local woman, Elisabetta Merzari, as his wife in 1546. 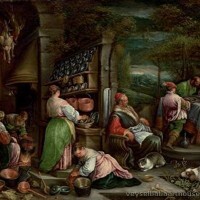 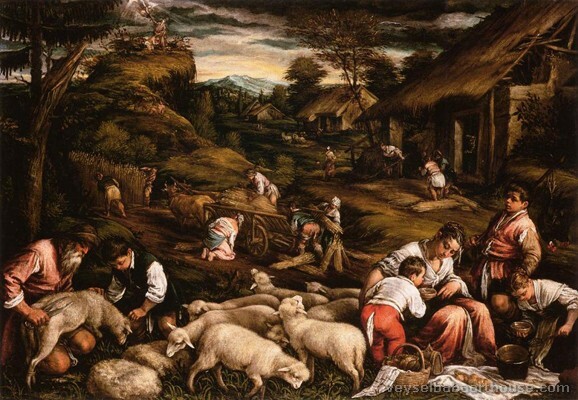 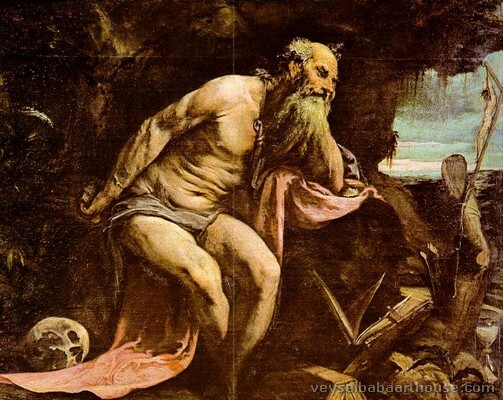 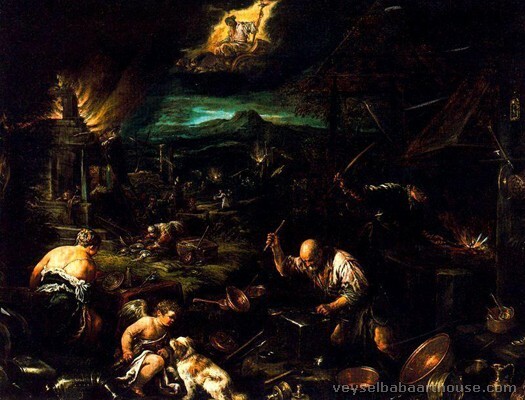 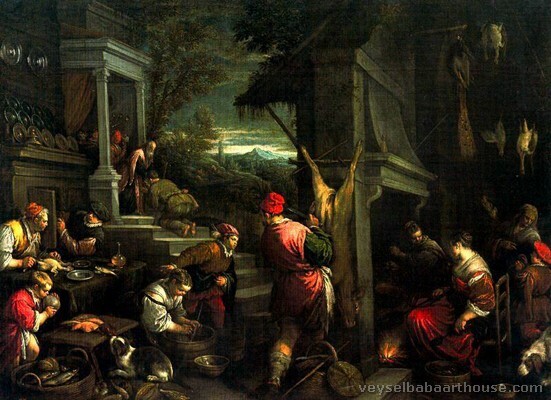 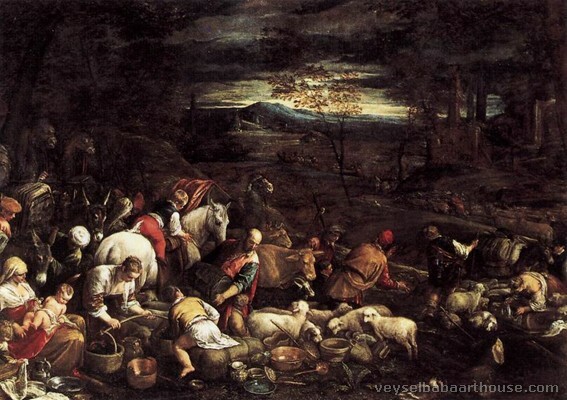 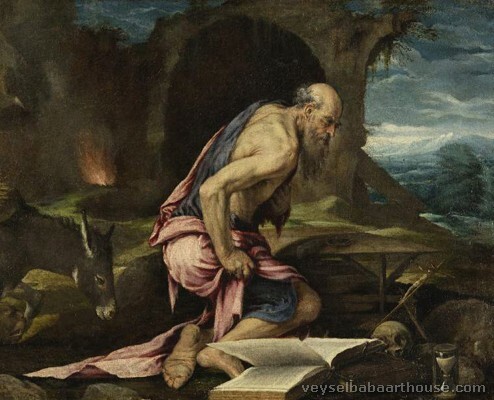 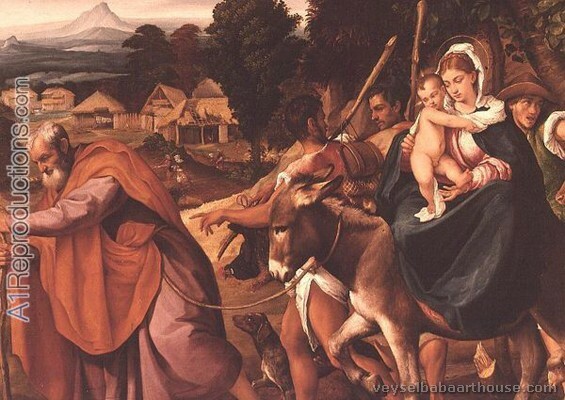 He took over the management of his family workshop, which would eventually come to include his four sons, Leandro Bassano, Francesco Bassano the Younger, Giovanni Battista da Ponte, and Girolamo da Ponte. 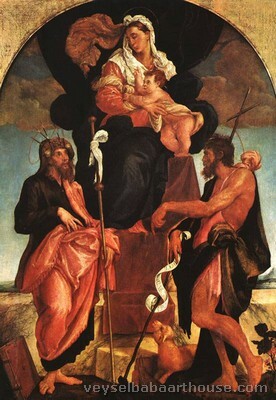 After his death in 1592, his sons continued to produce numerous works in his style, making it difficult for later art historians to establish which pieces were created by Jacopo himself and which works were created at the hands of his progeny. 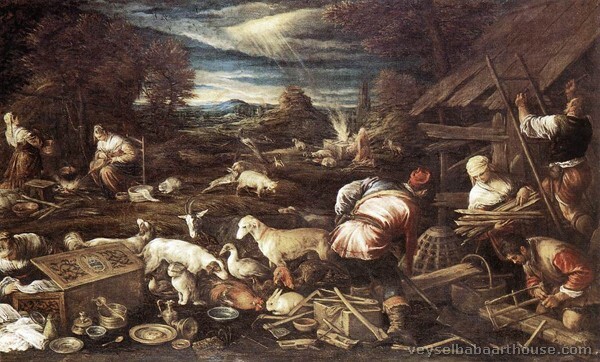 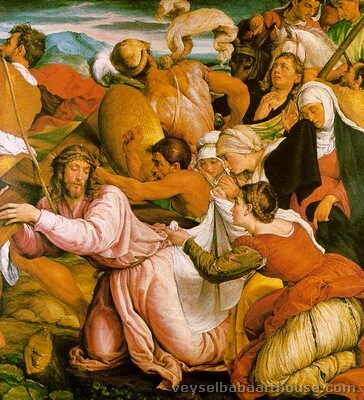 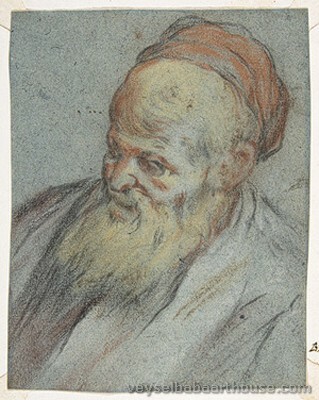 What makes Jacopo Bassano particularly unique amongst his fellow Renaissance artists was his ability to incorporate diverse artistic influences (including Dürer, Parmigianino, Tintoretto, and Raphael, amongst many others) into his work despite his reluctance to leave the comfort of his home town. 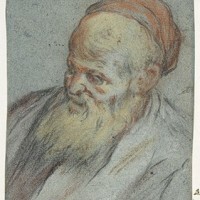 This is attributed to his exposure to prints by these artists, of which he was most likely an avid collector. 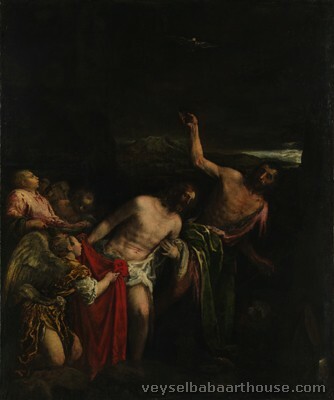 Bassano's ability to experiment and absorb stylistic qualities from other contemporary artists is evident in the four distinct periods seen in his artistic legacy. 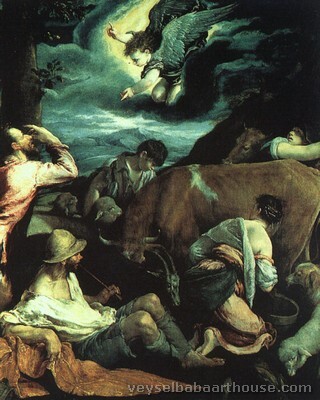 Each period shows the artist's struggle to reconcile his own aesthetics with the styles of his peers. 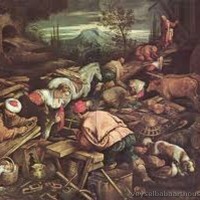 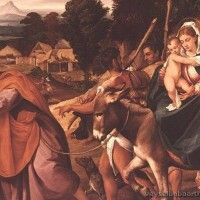 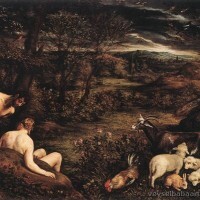 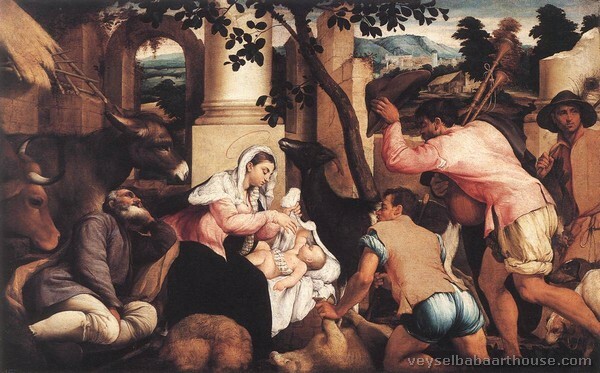 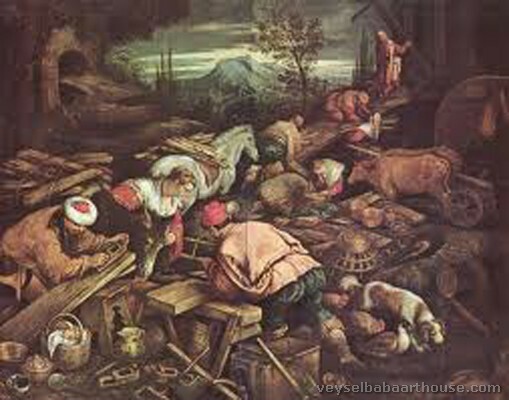 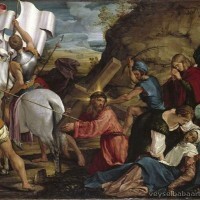 Jacopo Bassano's early works from about 1530s and onward. 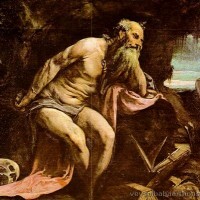 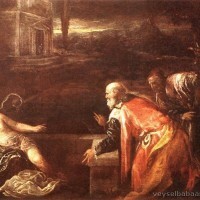 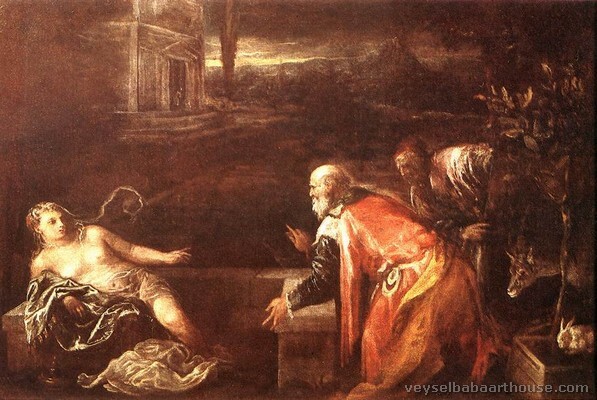 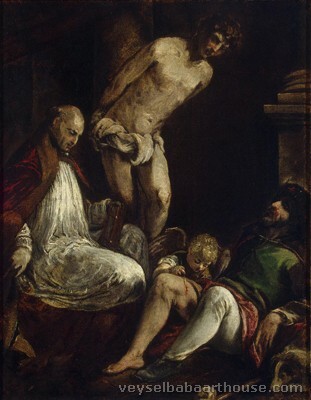 Bonifazio de Pitati imparted upon his young pupil a lasting appreciation of Titian's work, the influence of which is clearly seen in his early pieces. 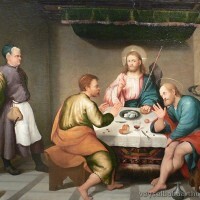 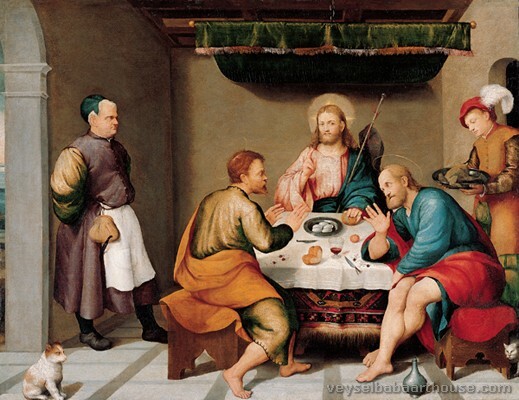 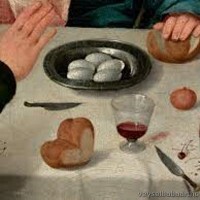 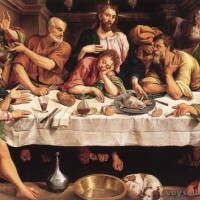 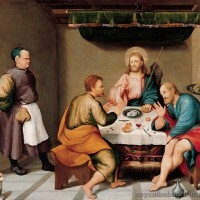 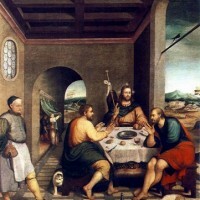 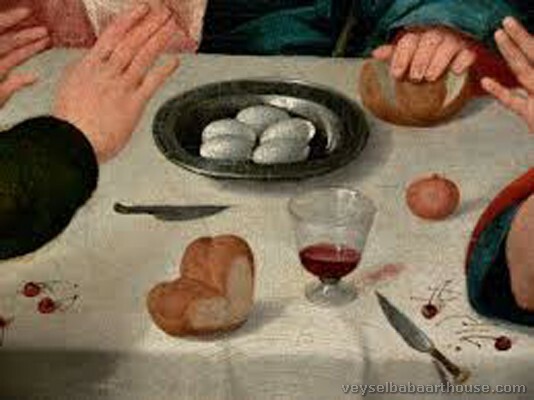 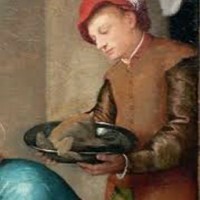 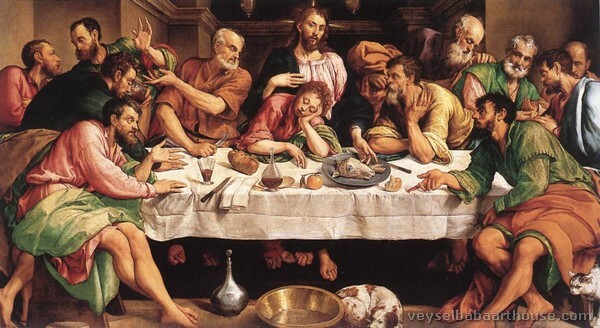 Bassano's earliest paintings exhibit his lifelong obsession with brilliant colors that he had seen in Titian's beginning works, particularly in Bassano's Supper at Emmaus (1538). In this commission for a local church, Bassano fills the canvas with rich, luminous colors that help the distinguish the figures from their surrounding environment. 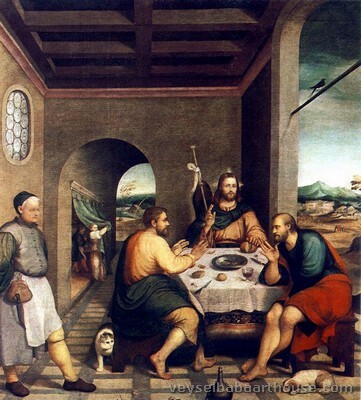 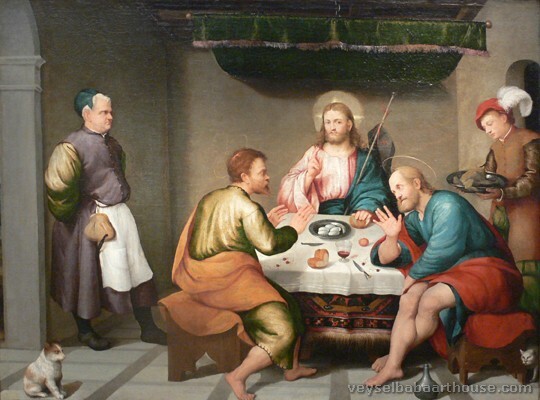 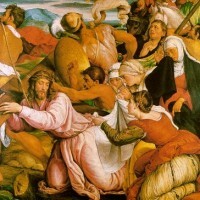 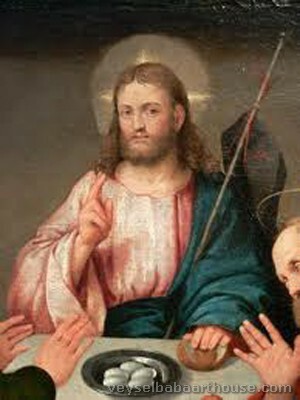 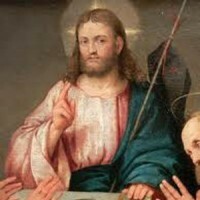 He breaks away from the practices of his contemporaries by placing the figure of Christ towards the back of the scene and allowing the lay-people around him to play a more significant part in the composition of the piece. 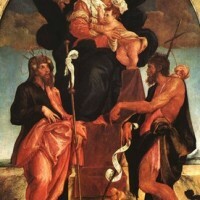 They are also unique in their dress. 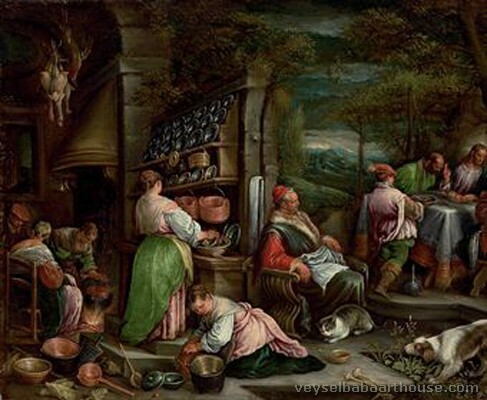 Instead of clothing his figures in the draping, shapeless fabrics many Renaissance artists equated with Classical Roman fashion, Bassano chose to feature figures in 16th-century clothing. 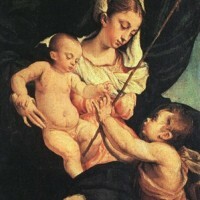 The details of this piece are the most often discussed aspect of it. 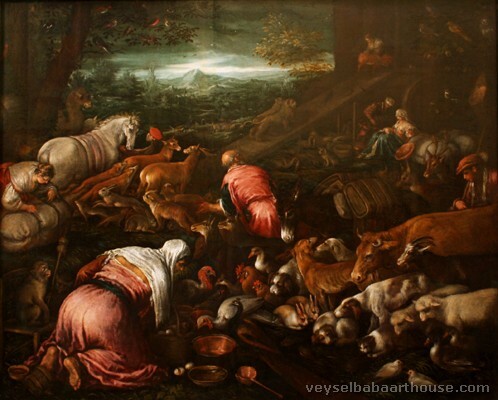 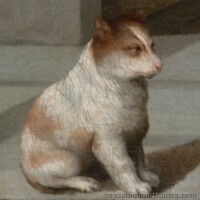 To many art historians his inclusion of various food on the tables, a dog lying down and a cat slinking around the chairs, as well as numerous secondary characters is a testament to Bassano's practice of drawing from life instead of relying on stylistic conventions of the age. 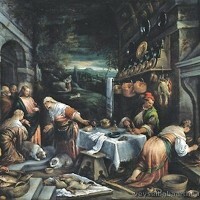 Bassano's piece, The Last Supper (1542) is a work that shows Bassano's new interest in the trend of Mannerism in Italian art. 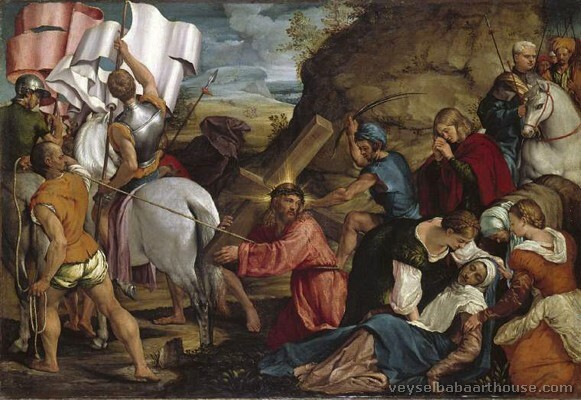 Within the piece one can see Bassano's exposure to the prints of Dürer and the paintings of Raphael, especially in the highly charged emotions of the subjects and the dynamic and highly stylized posture of the figures. 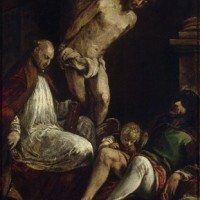 The Mannerist preoccupation with highly developed design elements is evident in Bassano's careful placement and "character" of the figures to create an active composition that leads the viewer's eyes around every detail of the canvas. 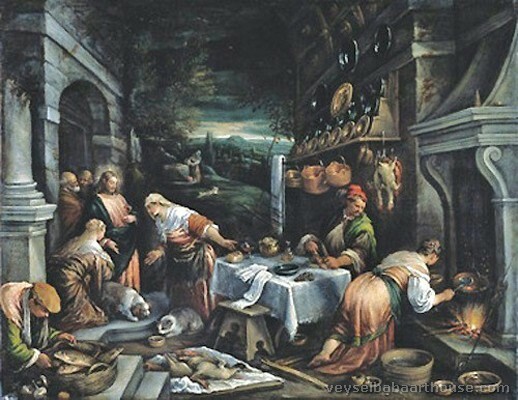 Compared to his earlier, more staid figures, Bassano's figures in The Last Supper seem alive, their skin seeming to hide rippling muscles and sinews instead of the wooden, tired postures of his early work. 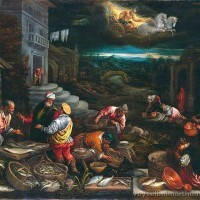 Jacopo Bassano started experimenting with light and his subjects around 1550s–1570s. 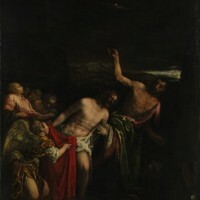 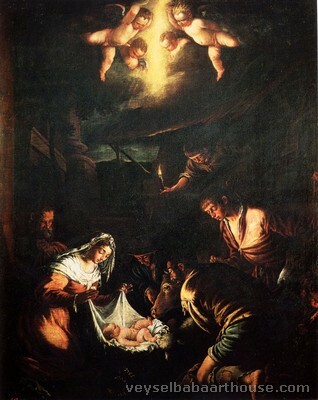 It was during this period that Bassano was one of the first artists to paint a "nocturne", or a painting in a nighttime landscape with artificial lighting. 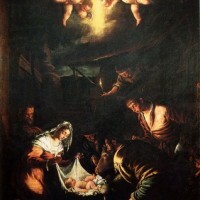 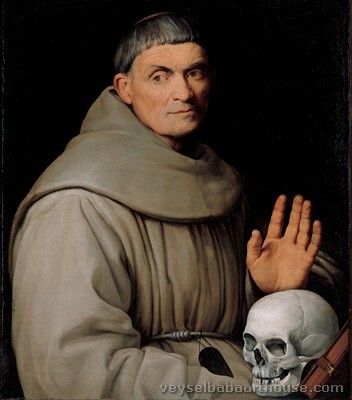 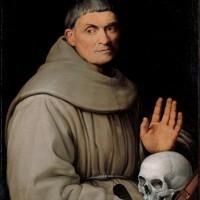 This type of painting was extremely popular with local audiences and made Bassano paintings highly valued. 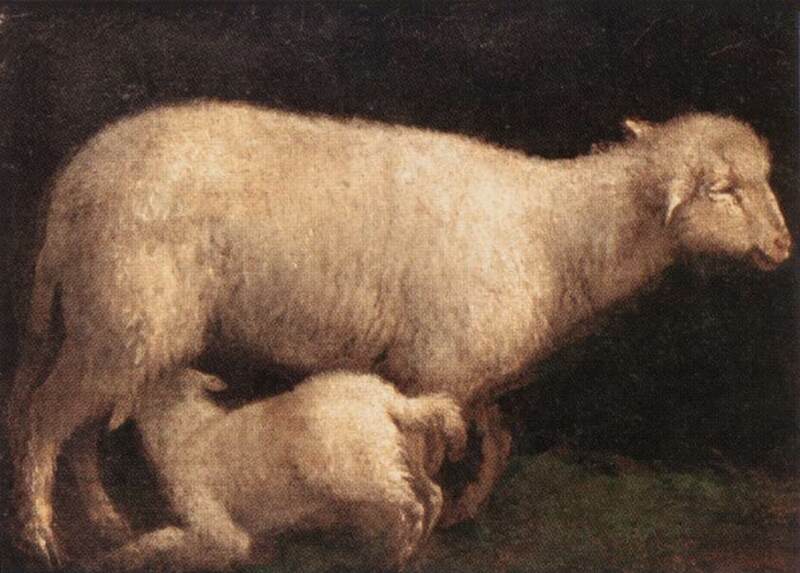 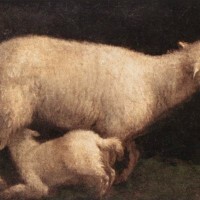 His works also began to feature more heavily the pastoral elements he had inherited both from his father and from his environment. 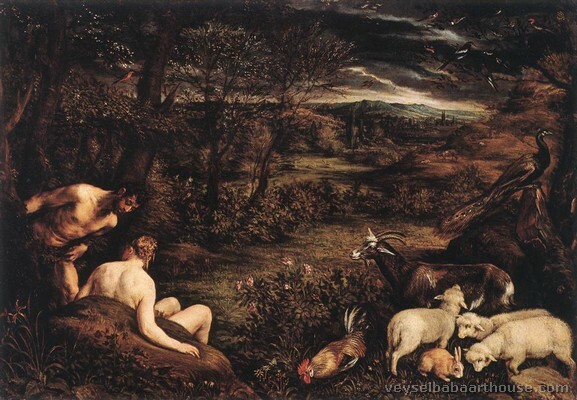 He began to show religious scenes not in Classical Roman settings (as his Renaissance counterparts were wont to do) but placed the figures in a more natural landscape where the trees and the flowers were as carefully rendered as his figures.